The warmth and humidity that comes with summer creates the perfect conditions for plant diseases to thrive. Poor soil fertility, unbalanced environmental conditions and pest infestations are all channels that invite fungi, viruses and bacteria to weaken or kill plants. You can get ahead of these problems by actively choosing preventative solutions, even at the height of summer. Some of these biorational solutions actually work best when used pro-actively to suppress diseases. Now is a great time to treat before a problem becomes a crisis! 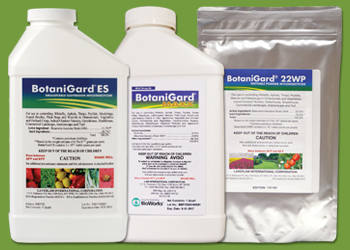 Biorational solutions (those utilizing beneficial or symbiotic fungi and bacteria) are an economical and highly effective option against a wide range of foliar and soil diseases. You will get the best possible results before the onset of symptoms, but if symptoms are already present, simply begin treatment as soon as possible. Trichoderma harzianum, strain T-22. This patented fungus utilizes several methods to suppress fungal diseases. Principally, it forms a physical bond with the root system of the plants to establish itself in the root zone and thereby prevent other pathogens from colonizing the soil. The RootShield® line of products has this fungus as its active ingredient. They are all OMRI Listed and come in a variety of formulations and sizes to best suit your personal needs. Stressing over spider mites? Learn how easy it can be to get control of this pest in 5 easy steps. 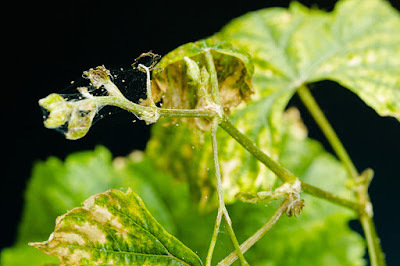 Spider mites are a sworn enemy to growers and can cause great damage and stress. But why fret when there are simple ways to make controlling and combating these pests easy? Easy? Yes! If you take the rights steps, are proactive and have the necessary tools, you can manage spider mites and do it without chemicals. 1) Be prepared. Keep an eye on susceptible crops. While this might seem obvious, noticing changes in your plants’ health can be a great marker to alert you before an infestation sets in. Healthy plants have higher brix levels and are less likely to attract pests. In addition, avoiding growing conditions such as tight container spacing and drought stress will reduce susceptibility. 2) Know what spider mite damage looks like. Damage on plants can include small yellow-brown spots on leaves (stippling), curling, leaf drop and the telltale spider sign, webbing. Seeing these pests with the naked eye is difficult as they are small, but not impossible. If you don’t have access to a microscope, place a piece of white paper under affected leaves and gently shake them. If you see what looks like reddish-brown specs of pepper on you paper, you’ve got mites! 3) If you can, identify what type of spider mite you have. This will help you to better select the right control measures. This can be a tricky task, and a tool such as the Active Eye 60X Clip-On Phone Microscope can be helpful to have on hand. If you aren’t sure what kind they are, give us a call and our consultants will be glad to help you! Sanitation: This is an easily overlooked step. Wash all surfaces of your growing areas. When planting, choose organic, locally-sourced soil mediums and inspect plants for mites before planting. Boost optimal growing conditions: Support your plants’ health to aid them in the fight! Reduce water and nutrient stresses by boosting absorption with a product like Therm X-70. 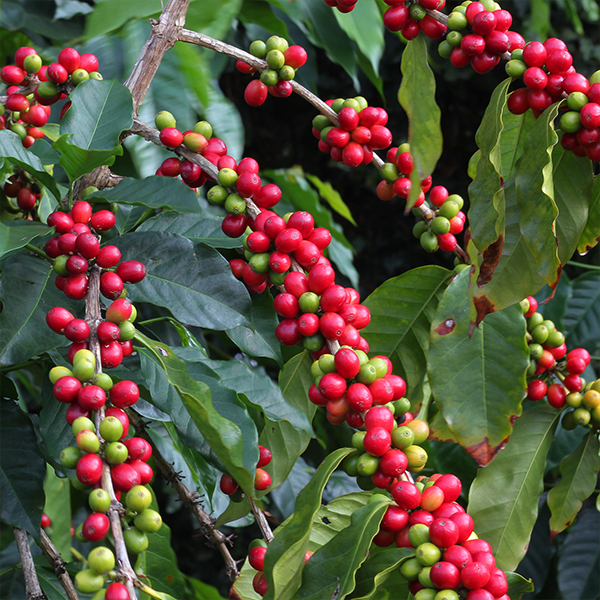 Organic fertilizers break down slowly and help to avoid nutrient-based stress. 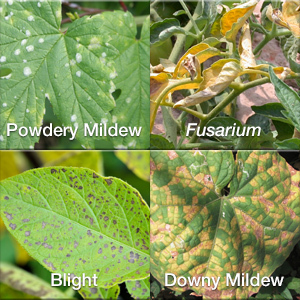 Knockdown & Chemical Control: Treat existing spider mite populations with organic knockdown sprays if allowed. Naturally derived insecticide sprays like Neem Oil, Pyrethrins, Azadirachtin and Horticultural Oil can be sprayed directly onto adult mites, larvae, nymphs and eggs to kill on contact. Repeat applications at 3-day intervals until control is achieved. Horticultural oils can also be applied to overwintering sites to reduce egg populations the following season. Do not apply oil sprays to plants in high temperatures (>80°) or intense lighting. Biological Control: Ideal for spider mite control during flowering. Introduce Beneficial Insects after knocking down spider mites for continued control. 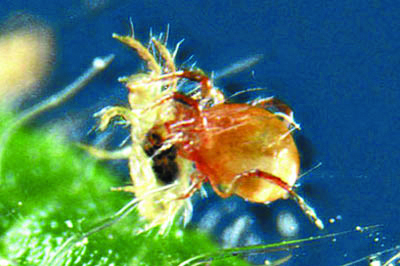 Green lacewing and ladybugs are helpful, but spider mite predators are best (P. persimilis, N. californicus). Match your growing conditions with the mite predators’ optimal conditions and time releases with other integrated pest management approaches. 5) Enjoy your success and continue to monitor pest populations. Keep an eye out for insect enemies, then relax knowing that you have all the tools at hand to win the next battle. Controlling spider mites can be easy if you are prepared! Rest assured knowing that ARBICO Organics is your ally in this and we are always ready to assist you with all your growing needs! Almost everyone is familiar with the name Typhoid Mary, or at least the connotation of the name. Poor Mary, she had no idea that she carried the bacteria that sickened at least 51 people and killed 3. She was far from the only, or even most destructive, carrier of this disease; there were unknown numbers of asymptomatic carriers (at least hundreds, probably thousands) and some of these were known to have infected large numbers of people. But Mary’s notoriety and resistance to accepting responsibility worked against her and she ended up living 26 years in forced isolation in a public hospital, until her death at age 69. What does Typhoid Mary have to do with the Gypsy Moth? Nothing directly, perhaps, but they both first appeared in the Northeastern United States within a couple of decades of each other and both stories begin with one colorful and irresponsible character. For the origin story of the Gypsy Moth, we have Étienne Léopold Trouvelot. Trouvalt was born in France, but came to the United States in his 20’s on the heels of political unrest in his homeland. He eventually settled with his family in a small town in Massachusetts, where the seeds of his entomological infamy were sown. Decide to do nothing. Ants are critical detrivores in their eco-system. 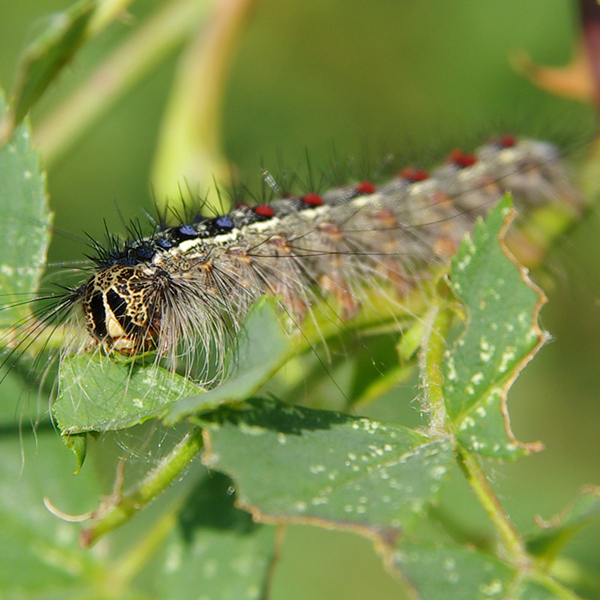 They help break down dead and dying plant material, eat soft-bodied pest insects and aerate the soil. (Click here for more information on the importance of ants) So if they are not bothering humans or your favorite 4-legger, it may be best to leave the ants alone. Control them efficiently and safely by understanding the behavior and social structure of the species of ant you are dealing with. Take Out the Queen and Kill the Colony. Entomopathogenic* beneficial nematodes can be used to parasitize and kill the queen. The species, Heterorhabditis bacteriaphora, can be applied to the ant nest and they will seek out and kill the queen through the process of parasitizing and injecting their bacteria into the queen. Nematodes must be applied directly to the ant mounds so that they can reach the queen. Sharing Doesn’t Necessarily Mean Caring. Because the ant social structure means that food will be brought into the nest and shared, we can take advantage of this behavior to achieve control. Many species of ants are attracted to sugar, so the bait traps that use a sweet, syrupy liquid laced with borax or boric acid are very effective both for indoor and outdoor control. For best results, it is important to place these traps along the trails that the ants are travelling. The worker ants will take bits of the sugary liquid back to the nest to share and expand the deadly effects of the borax or boric acid. The content of these traps is not enough to cause harm to your 4-leggers but it is best to keep the traps out of their reach anyway. Much like bees and humans, ants live complex lives. They are ubiquitous to the planet and some do good while others cause harm. Although some of their behaviors are consistent from one species to another, there are unique behaviors by many ants. This can make controlling for them a complicated matter. However, proper identification of the species will help save time and money in treating them. Fire Ants can have multiple queens making control more difficult and the use of beneficial nematodes less successful. Organic controls include drenching their mounds with orange oil based Orange Guard Fire Ant Control and surrounding the mounds with Diatomaceous Earth. As they attempt to escape the Orange Guard, they pick up the DE and that desiccates their exoskeletons. Harvester Ants build their nests upside down – with larger chambers closer to the surface and small and smaller chambers deeper in the nest. They are stinging red ants and are often confused with fire ants. However, their behavior is not like fire ants and their sting is not as severe. They can be controlled with nematodes and bait traps. 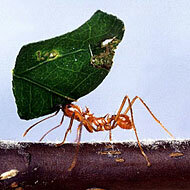 Leafcutter Ants – This is a group of 47 ant species that form large and complex societies. Their social structures are second only to humans. 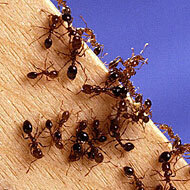 Their nests can span and radiate out to 6,400 square ft. Large nests can contain 8,000,000 individual ants. You can control them by using nematodes and DE at the mounds. You can also spray their target plants with a botanical oil. Or try pasting Stiky Stuff around the base or trunk of the plants that they are harvesting leaves from. *Entomopathogenic nematodes – A group of nematodes that cause death to pest insects. The word entomopathogenic refers to insect and pathogen (causing disease). These nematodes live as a parasite inside the host insect and they infect their host with a bacterial disease. Once the insect is infected, the nematodes reproduce multiple generations. The Queen is the most powerful ant in the hive. If the queen is lost – the colony is lost. She is the founder and leader of the colony. She populates the colony by laying thousands of eggs. She produces pheromones that induce the entire colony to work and remain together, while she stays deep within the colony, safe from predators. The drones are the males and have wings so they can perform their only task for the nest - mating with the queen. It sounds like a great life but once they mate they die. Drones are only around for a few days each year. The race is on! Mating takes place in the air not long after the queen exits her cocoon. Why in the air? Most likely for protection from predators while the queen is exposed. Once fertilized, she rips off her own wings and begins a new colony. The queen takes care of her first batch of eggs and once the first hatch is out of their cocoons, the workers take over the caretaking of the colony. More about the workers later. According to Iroquois legend, three women miraculously sprang from Sky Woman’s daughter. These women, known as the physical and spiritual sustainers of life came to be represented by corn, beans, and squash. These three plants were a gift from Sky Woman that provided the main food supply to sustain their culture.